There was a moment of panic when I walked into Borealis, the type that comes over you when you realise you’ve walked into the wrong room. We hadn’t, but the restaurant shares a space with a co-working office above that has an entrance and reception desk that wouldn’t be out of place in a hotel lobby. The Borealis dining room sprawls outward from an island bar in the middle of the restaurant, with exposed air ducts and pipes on the ceiling adding extra illusions of length to the place. Dim globes of light punctuate the room of trendy charcoal and deep blue interiors. Borealis opened as part of the Fora workspace in the summer of 2018. 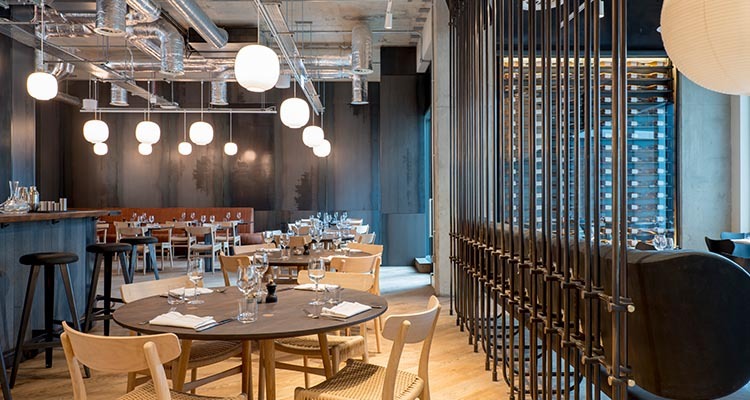 The Nordic restaurant is the third opening of Danish-born restauranteur Soren Jessen. A former banker, Jessen opened 1 Lombard Street just over 20 years ago and has since followed up its success with two other Nordic-inspired eateries: Ekte Nordic Kitchen and Borealis. The all-day dining spot, named obviously after the Northern Lights, takes advantage of its location by offering business meeting space, takeaway smørrebrød and pastries, and a fifth-floor terrace for private events. It’s my first time in a Nordic restaurant and I confess the closest I’ve come to Scandinavian cuisine is Ikea meatballs, but we’ve all got to start somewhere, right? 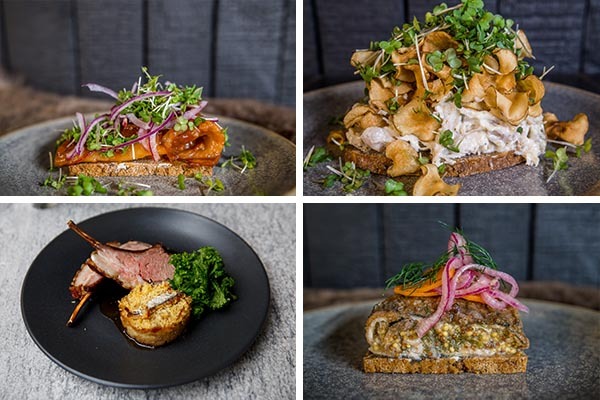 Moving far from the furniture store, Nordic cooking, and that of Head Chef James Burton focuses on curing, smoking, pickling, and serving lots of things on smørrebrød, an open-faced sandwich. The menu is a fresh mix of meat and fish dishes with some seductive-sounding ingredients thrown in: butter-fried bread, creamy gravy and smoked potatoes were my favourites. You can order herring smørrebrød three-ways: curried, tomato or onion. And you’re recommended to order at least one since it’s a classic Nordic dish and Borealis assure us they do it well. Onion herring was good: a dense, crisp rye bread layered with cool potatoes and egg combined with sour crème and slithers of herring — it was fishy but not overpoweringly so. Fried pork belly felt closer to home with hunks of pork topped with tangy apple remoulade and a colourful smattering of chives. The sliced potato, mayo and onions smørrebrød was pleasantly reminiscent of potato salad. Frikadeller, thick Scandi meatballs, were doused in a creamy light-coloured gravy and set beside a generous glob of gloriously buttery mash. The lingonberries and pickled cucumber gave the dish a sharp kick and much-needed dab of colour. Mushroom and chestnut kroppkakor (Swedish dumplings) were tightly packed with deep, fungi flavour while the chestnuts complemented the soft, earthiness of the potato. A side of Burning Love, mashed potato topped generously with fried bacon and onions, happily filled up our potato quota for the week. I insisted we ordered the grilled hipsi cabbage, a simple favourite that was aptly smokey and buttery in good measure. We finish with Kladdkaka, a type of Swedish chocolate cake with whipped cream & pistachio praline, another new one for me. It’s dense, gooey and very sweet with the inside having a texture that reminds me of taffy. It rounded off a lovely evening of trying and learning about Nordic dishes we’d never have known about otherwise. 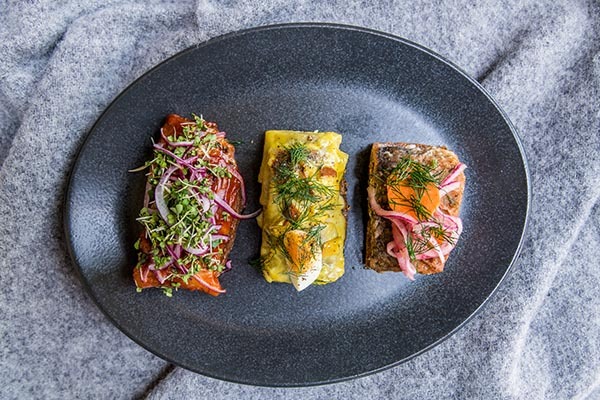 Borealis serves up traditional Nordic fare in an informal, classy setting where you’ll feel welcome popping in for a quick bite or three-course dinner date.